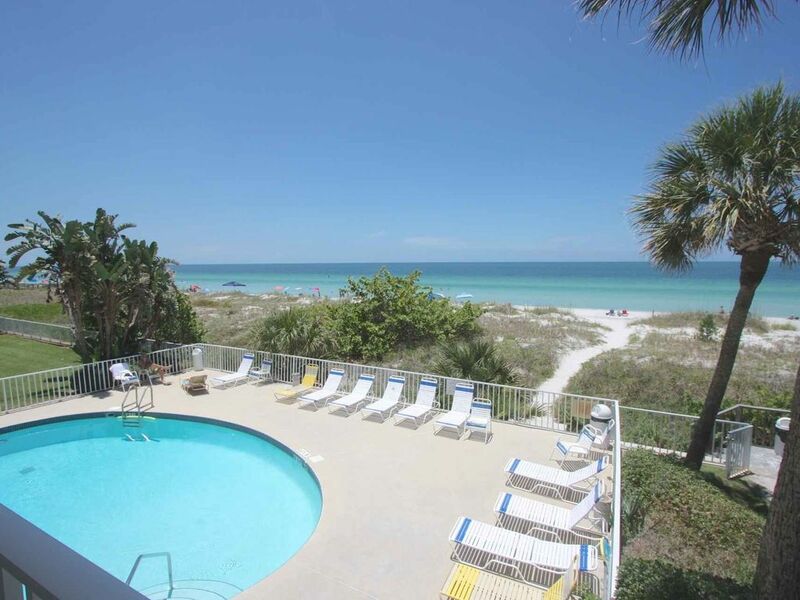 Watch the dolphins in the morning and the sunset in the evenings, in your Indian Rocks Beach vacation rental. Stroll the quiet beach or take a dip in the magnificent heated beachfront pool. If you are looking for a quiet retreat or romantic getaway, then you've found it. Two bedrooms and a sleeper sofa will accommodate up to six vacationers. King bed in the Master, two double beds in the 2nd bedroom. TVs in each bedroom as well as a big screen in the living area so you will never miss a game. Fully equipped kitchen with all brand new stainless appliances and granite counter-tops. Huge private balcony to just sit and take it all in. Stay connected with Wi-fi internet. Parking for up to two cars. This gorgeous Florida condo rental sits in a quiet section of Indian Rocks Beach, but is still very convenient to several restaurants and a convenience store that are within walking distance. There are also wo barbeque grills outside the building for guest use. Enjoy fresh local seafood at the award-winning Salt Rock Grill or casual eateries like Keegan’s and Guppy’s, watch the sun set over cocktails at The Pub or stop by the iconic Lighthouse Donuts for a quick snack, all just minutes from your vacation home.You can do as much or as little as you like at family-friendly Indian Rocks Beach, a serene beach town that offers spectacular white sand beaches and award-winning local restaurants. It's a perfect spot for romantic getaways, family vacations or a break from cold winter weather! SORRY, NO PETS OR SMOKING! THANK YOU! We have stayed at the Hamilton House the past 2 years and will be back for sure. The balcony and ocean view is spectacular! The condo is a great size and decorated beautifully. The only issue we had was the bathroom was not cleaned upon arrival and when on vacation that isn’t the first thing I wanted to do!! We are repeat visitors, and we really enjoy our stay here. The only reason I gave 4 out of 5 stars is because the beds in the smaller room need to be updated. They were not comfortable. Otherwise, this condo is our favorite and you cannot beat the location. Stayed at 105 Hamilton House the condo was exactly what I saw online. Was very well equip with everything. Was very clean. We had a beautiful view of the ocean was just perfect for the 6 of us. We will return we love the Gulf coast. We love this location and unit so much we have stayed here twice. We love the location, size, and amenities. Only two complaints, first the master bedroom mattress is in horrible shape. I was actually envious of the air mattress my daughter slept on all week. Second, the temperature in the unit is very off. While it is cool in the living room, bathrooms, and hallways, it was stifling in the bedrooms and dining room. There was at least an 8 degree temperature difference. Thankful for the box fan we found in the closet, we used it to push the cool air from the bathroom into the master bedroom. This condo and trip exceeded our expectations!!! The pictures online do not give it justice ! This condo is huge! And it was beyond clean!! Kevin with i trip was fantastic to work with. We had to change our date and then decided to come a day early and he was very accommodating! We hope we are able to come back next year and stay at Hamilton house again!! The beach was not crowded and our kids had a great time at the beach and at the pool!! You will not regret staying here!!! Great view from the condo. Management provided good customer service. Kitchen was well-equipped with quality cookware. The 2 drawbacks were the very old, lumpy and uncomfortable Master bedroom mattress and the extensive mold in the Master bedroom shower. We liked the unit and rented again for a month next year, assuming there will be a new mattress and the mold in the shower will be cleaned up with re-caulking. All of the bedding in the Master including the mattress have been replaced. Shower has been recaulked.